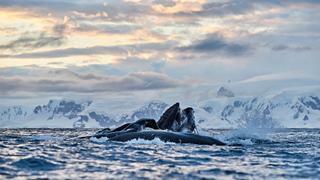 "Almost immediately, we are joined by two whales surfacing right next to the tender"
"...we spot our first penguins waddling by the water and chaotic excitement ensues." "I leave helplessly in love with the white continent." “WATCH FOR THE BUBBLES!” Richard White, our expedition leader, is standing up in our tender, on the look out for humpback whales. Three days into our Antarctic adventure we are used to the drill. One minute we are on board, tucking into a three course dinner, all napkins, silverware and serenity; the next we are rushing down to Hanse Explorer’s dedicated mud room, changing into our waterproofs and transforming ourselves into explorers. 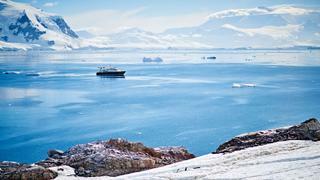 Such is the nature of a journey to Antarctica. 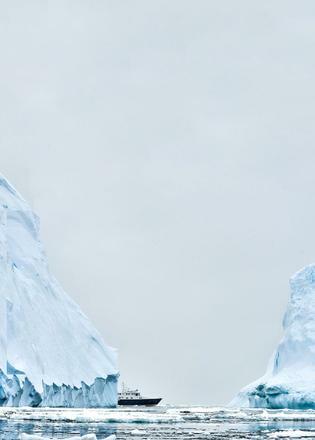 When it comes to making plans, the icy continent is defiantly in charge. Dinner can wait. In this instance, White has spotted signs of activity as we are sailing along the Gerlache Strait and, in typically understated fashion, he has suggested we might see “one or two” whales if we head out to the water. Five minutes later, with the crew helping each of us into our outdoor gear, we are adrift, our Zodiacs dwarfed by the vast, snowy wilderness. We are watching for circles of bubbles appearing on the surface of the water, a telltale sign that enormous humpbacks are about to come up to swallow thousands of krill, their huge mouths agape. Almost immediately, we are joined by two whales surfacing right next to the tender, stopping to dive down and fluke (show their tails) so close to us that we feel their icy spray. Within seconds, I am wiping away tears with my enormous ski gloves. The presence of these gargantuan mammals is overwhelming. Each time they move away they leave behind a liquid footprint, a massive circle of still water, and then a few minutes later the bubbles appear again and we all gasp in unison. In the distance there are many more whales, sending up tall plumes of air and water through their blowholes. Of course, life-changing adventure is not easy to access. Antarctica is a headache to reach – and after multiple flights and a bad weather delay in Punta Arenas in Chile, we are all fit to drop by the time we arrive on King George Island. But as we walk from the plane down to the shore to reach Hanse Explorer, we spot our first penguins waddling by the water and chaotic excitement ensues as exhaustion gives way to adrenalin. The EYOS Expeditions team must be silently amused as we all start desperately snapping away at the birds. 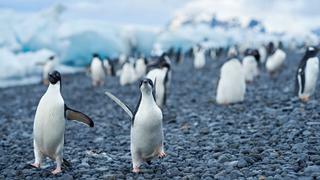 Only they know that in the coming days we will be seeing teeming colonies of penguins in much more remote settings. And boy, is it remote. As a committed worrier, I’d done my research before I left London and there was much to fear. A terrifying absence of shoreside support, no human life except a scattering of research stations dotted across the continent. Antarctica had even been in the news before I left because a crack more than 100 miles long in an ice shelf, Larsen C, had left a vast area of it “hanging on by a thread”. I’d organised my emergency evacuation insurance before I left and imagined every conceivable worst case scenario. Stepping onto Hanse Explorer quickly changes all of that. While the outside world feels isolated, even intimidating, this 48 metre ice-classed superyacht immediately feels like home and its relaxed open ship policy means that nowhere is off limits. We often head up to the bridge with a glass of wine, talking through our route with Captain Jens Köthen or spotting wildlife with White (the man has a sixth sense for spying killer whales). Other times, we all gather in the lounge, sipping on Baileys spiked with glacier ice we’ve plucked out of the sea earlier that day. 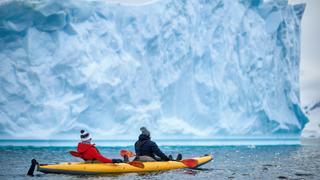 The worrier in me has already decided that there are certain parts of the itinerary I won’t be partaking in: kayaking in Paradise Harbour (with those mammoth whales for company? No thanks); a polar plunge (who in their right mind would swim in Antarctica? ); hiking on ice floes (in the middle of the sea? Crazy). And yet, as time goes by and the expedition team displays an encyclopedic knowledge of this region and everything in it, I become braver. Not only do I end up doing all of the things I’d sworn I wouldn’t, I want to do them all again, straight away. The polar plunge, particularly, proves to be something of a breakthrough for me. I can barely get into an outdoor swimming pool in the height of summer, but such is the power of the camaraderie and the crew (and the promise of a vodka and sauna immediately afterwards) that I change my mind. Something of an Antarctic ritual, everyone gathers on the beach club to egg each other on and Captain Köthen is the first to take the plunge (still wearing his hat). Despite being able to see my breath and the large blocks of ice floating in the water, I follow in just my normal swimsuit. You are advised to jump, turn and come straight back up the steps – you don’t have to tell me twice. 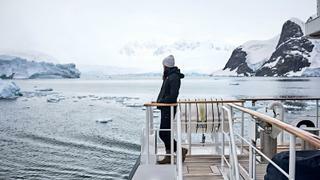 As I emerge from the icy water (it is minus 0.5°C) to whoops and applause from the crew and my fellow guests, I am filled with the most incredible surge of energy. Jens Köthen, right, is the hugely experienced captain of Hanse Explorer. 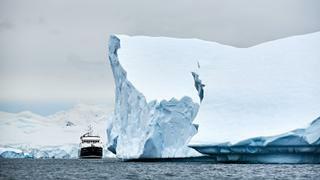 Below: guests’ activities include kayaking in Paradise Harbour the pristine, tabular bergs we first spot in the Antarctic Sound to the vivid blue formations we encounter further south – but the sheer drama of this is second to none. A week into our trip we are all beginning to feel like true adventurers – adept at putting on our kit (all four layers of it), able to differentiate between penguin species, breaking through ice at will. However, when we stop off at Vernadsky, the Ukrainian research base on Galindez Island in the Wilhelm Archipelago, we realise we are mere novices. The handful of men who greet us have been based there for 10 months. They show us around the place they call home, complete with meteorology stations, science labs, a sick bay, sparse gym and, finally, the southernmost bar in the world. It was originally built by the British, using excess wood from a shipment intended for a new pier. Afterwards, we stop off at Wordie House, an old research hut on Winter Island where everything has been left untouched since it was last used in the 1940s. Typed recipes for penguin roulade and seal hamburgers lie gathering dust on the table, books borrowed from a library and never returned sit on a makeshift shelf. Returning to Hanse Explorer, where the crew are ready with hot chocolate (laced with rum) and the table is laid out for supper, we are just that little bit more grateful. We aren’t in danger of overshadowing Scott or Shackleton quite yet. Spoiling it may have been, but it has also been a transformative adventure. With nature and wildlife on such a monumental scale, it can’t fail to be. I leave helplessly in love with the white continent. On the last day, after we say goodbye to the captain and crew and climb into the tenders for the last time, I am relieved to see that I am not the only one who is shedding a tear. Captain Köthen sounds the yacht’s horn and we turn to wave goodbye to Hanse Explorer, our happy home in one of the world’s most remote destinations. 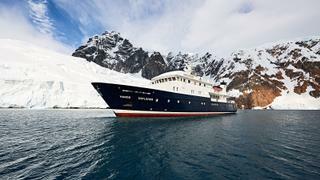 For further information on booking bespoke trips, such as exploring Antarctica on a superyacht, contact Eyos Expeditions.